Petrol price in Delhi rose to a record Rs 79.31 a litre and diesel climbed to an all-time high of Rs 71.34. Delhi charges a VAT of 27 per cent on petrol and 17.24 per cent on diesel. 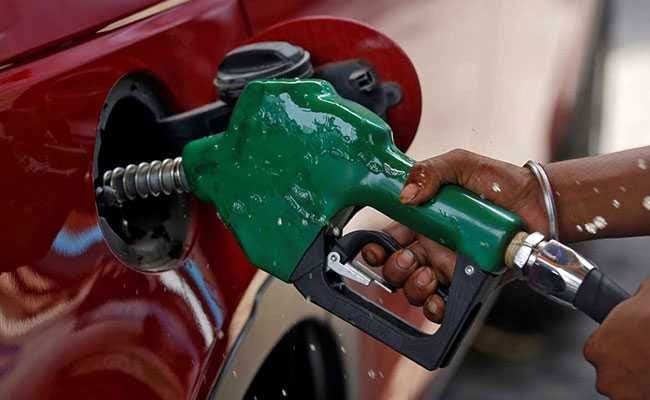 New Delhi: The government will not cut excise duty on petrol and diesel to cushion spiralling prices, which touched fresh highs Tuesday, as it has limited fiscal space available to take any dent in revenue collections, a top official said. With imports becoming costlier because of a free-fall in rupee against the US dollar, the government believes the current account deficit will overshoot the target and it cannot "disturb fiscal maths by cutting excise duty on petrol and diesel," said the official, who wished not to be identified. Petrol and diesel prices Tuesday touched fresh highs as rupee dipped to a record low of 71.54 against US dollar, making imports costlier. Petrol price in Delhi rose to a record Rs 79.31 a litre and diesel climbed to an all-time high of Rs 71.34, renewing calls for a cut in excise duty to cushion the spike. Almost half of the retail selling price of the two fuel is made up of central and state taxes. According to a price notification of state-owned fuel retailers, petrol price was Tuesday hiked by 16 paise per litre and diesel by 19 paise. Fuel rates have been on fire since mid-August, rising almost every day due to a combination of a drop in rupee value and rise in crude oil rates. Petrol price has risen by Rs 2.17 per litre since August 16 while diesel rates have climbed by Rs 2.62 - the biggest increase in rates witnessed in any fortnight since the launch of daily price revision in mid-June last year. Commenting on the relentless price rise, former Finance Minister P Chidambaram said: "Relentless rise in prices of petrol and diesel is not inevitable. Because the price is built up by excessive taxes on petrol and diesel. If taxes are cut, prices will decline significantly." "We already know that there will be a hit on current account. Knowing that we can't disturb the fiscal deficit, we should rather be fiscally prudent," the official in the finance ministry said. In an election year, the spending cut is not an option, the official said reasoning that it would hamper government's spending on development schemes. "The government cannot disturb fiscal maths by cutting excise duty," he said. Last week, credit rating agency Moody's Investors Service said there are risks of India breaching the 3.3 per cent fiscal deficit target for the current financial year ending March 31, 2019, as higher oil prices will add to short-term fiscal pressures. CAD will widen but will not jeopardise India's external position, and the gap will remain significantly narrower than five years ago, it had said. The government has budgeted fiscal deficit to be at 3.3 per cent of gross domestic product (GDP) in the current 2018-19 fiscal year. Also driven by higher oil prices and robust non-oil import demand, Moody's expects the current account deficit to widen to 2.5 per cent of GDP in the fiscal year ending March 2019, from 1.5 per cent in fiscal 2018. Almost half of the fuel price is made up of taxes. The Centre currently levies a total of Rs 19.48 per litre of excise duty on petrol and Rs 15.33 per litre on diesel. On top of this, states levy Value Added Tax (VAT) - the lowest being in Andaman and Nicobar Islands where a 6 per cent sales tax is charged on both the fuel. Mumbai has the highest VAT of 39.12 per cent on petrol, while Telangana levies the highest VAT of 26 per cent on diesel. Delhi charges a VAT of 27 per cent on petrol and 17.24 per cent on diesel. The central government had raised excise duty on petrol by Rs 11.77 a litre and that on diesel by 13.47 a litre in nine instalments between November 2014 and January 2016 to shore up finances as global oil prices fell, but then cut the tax just once in October last year by Rs 2 a litre. A litre of petrol in Mumbai costs Rs 86.72 while diesel is priced at Rs 75.74 per litre. Prices in Delhi are the cheapest in all metros and most state capitals due to lower sales tax or VAT. Officials said the spike in rates is on account of exchange rate falling to a record Rs 71 to a dollar, depreciating by Rs 2.5 in a month. Also, crude oil has gained $7 a barrel in a fortnight, driven by fears that the US sanctions on Iran will likely contract supplies.